Whenever I get a resume from a student looking for an internship, I end up giving them an impromptu resume critique. I give the same advice over and over, so I decided to just write it up here. Next time I get a resume from someone I will just send them a link to this article. I know you've probably read your college career center guidelines on writing resumes. Understand this: college career centers are designed to get you a job at a giant faceless company doing something like, I dunno, paper distribution or enterprise databases. These career centers generally know nothing about getting you a job in the game industry. Most game companies are small. Almost all game companies have fewer than 1,000 employees. In fact, most game companies employ fewer than 200 people, and many game companies are in the 30 to 100 person range. Your college career center tells you to include a clear objective at the top. All of your contact information. Your complete employment history. Your education with relevant coursework. Honors and awards. Activities and special interests. Your college career center is giving you mostly bad advice. So throw that out the window. Pretend you never learned any of that stuff. Remember this: the purpose of a resume is to get you an interview. That's it. That's all it's for. I don't care what is on your resume, if it intrigues me enough for me to want to set up a phone call or an on-site interview, your resume did its job. Many game companies get scores of applications for internships and jobs. Imagine being the person screening all those applications. Brevity will be appreciated. If you are a college student, you have not done enough interesting stuff to merit a resume that is more than one page long. Once you've been in the industry for twenty years -- yeah, you've earned it. Go wild and make it two pages! Because you're keeping it to one page, you have to view the resume as a game of limited resources, where the resource in question is space. When I'm reviewing a resume, I often look at it in terms of number of lines of text taken up by something. Yoyodyne Corporation, Boston, MA Summer 2008. Intern under John Smith and Jane Doe. Fixed computers, diagnosed network problems, maintained IT ticketing sytem. Baseball, Winter 2002 - Present. Awesome University: varsity team member. Hometown High School: team captain, led team to fifth place in regional championships. This resume dedicates the same number of lines to baseball as job experience. What you are telling me is that your experience playing baseball is every bit as relevant as your experience working in IT. This is not a very good way to position yourself on a resume. routers/switches/hubs, maintained our RT ticketing sytem, trained new IT interns on proper use of RT. College and High School Baseball, Winter 2002 - Present. I had a conversation with Jeff Ward about formatting. He thinks you should put your work experience in bullet point format, because it's more readable that way. I happen to like a comma-separated list, because I like the information density. I think formatting on that level just comes down to the particular person reading the resume, so I wouldn't sweat it. I will say this: keep your resume clean, make good use of negative space, put your name in pretty big font, and cram all your contact information into the top inch of your resume. The reason for the last one is I often see resumes where the contact information takes up literally half the vertical space on the page. Again, it comes down to what's important enough to use that space. If you don't want to use a package like Scribus to lay out your resume, you can use tables in Microsoft Word to the same effect -- setting the tables to "invisible" will get you the same effect of stacking text in columns. For the love of all things holy, recall that you are applying for a job in game development. I do not care that you were a sandwich artist at Subway. I do not care that you were a waiter. The stuff you include doesn't have to be game development per se, it just has to be relevant. I might care that you worked part time for your dad's accounting firm, but only if you include specifically that you know a lot about Microsoft Excel from that experience. If you worked as an artist on an animated film, okay, now you're in the realm of complete relevancy, even though that isn't a game job per se. And if you don't have enough experience and can't really fill all the space in your resume... maybe you should be spending your time doing things relevant to game development. Work on a game in your spare time, for example. That's way more helpful than anything you'll do for a random summer job. Also, if you are in college, I don't care about what you did in high school, unless it is very very specifically game related. So if you made some games in high school, let me know about those. If you ran a game review website in high school, by all means tell me. But I don't care about other stuff. Your SAT scores? Useless to me. Student activities? Useless. Even your AP courses are useless -- if you're applying for a programming job, AP Computer Science is irrelevant because I would hope you've taken higher level computer science courses in college. Game developers don't care about your credentials. Where you graduated from, what classes you took, that only matters a tiny bit. What we care about is what you have done. So please include a section for projects you've done. This includes games or mods you've made on the side, as well as non-trivial school projects (final projects for classes and the like). That nice, and I'm really glad you're letting me know you've built games in XNA. But could you be more descriptive? Maybe tell me some of the stuff you implemented for those games? Better yet, just include a URL to a web site where I can download the game, or see its source code, or even just view a video of some of the gameplay. That would all be excellent. You should have a website with lots of interesting, relevant stuff on it. And then include the link in your resume. You can read more about this in my article about what your website should contain. It's true. I'm not an idiot. So I can tell when you're padding. Stop doing it, it makes you look like a desparate liar. Look up information about the company you're applying to. In the case of a small company like mine, look up information about me. About once a month I get a resume from a 3D artist looking for a position at a game company. I write them back to let them know that if they'd read our company's website, they'd know that we essentially make database software for game developers and as such have no possible need for 3D artists. This is a two-way street: if you research my company and send me a resume that's chock full of all the database development work you did in college, I am almost guaranteed to get in touch with you. 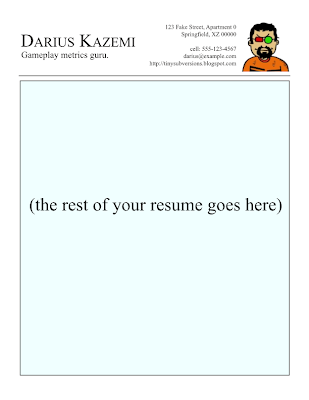 Also, if you have made like a dozen games, and worked four different game development internships, and have done a ton of other relevant stuff, your resume doesn't have to be one page long. It can be two pages long. But that's only once you've cut everything that is not specifically game-related.